I've been asked about incorporating music with character. While there are certain programs out there that do it, many schools may not consider music to be a high priority in the education of their kids, and understandably so. Schools are busy and it can be difficult to find the time to figure out some sort of music program with meaning and purpose. That said, it IS possible in a school environment. Below is an article I wrote for Camping Magazine many years ago. It's all about theming music to meet your end goals. Maybe it will spark some ideas and get the creative juices flowing. Let's work together to bring a positive musical experience to your school. 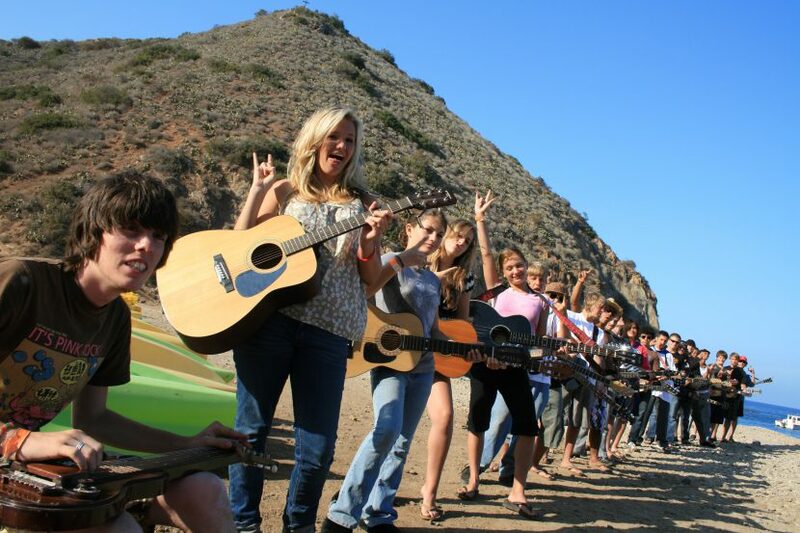 Add Some Music to the Mix: A California Camp Fills a Week With Music — And So Can You! Only sometimes do people get to hear it because normally they're inside as a part of it. But maybe you left a jacket in your cabin, or have to run to the director's lodge for a notebook. You're walking alone across Camp Fox's Parade Grounds, listening to the waves lap at the beach, when you notice the thunderous eruption from the wooden A-frame dining hall nestled into the cove that is your island paradise for one week every summer: Hundreds of teenagers singing together, unabashedly belting at the top of their lungs the silliest songs ever written alongside the most popular radio hits. That sound silences the ocean. It's the only thing you'll ever want to hear, if you're lucky enough to hear it once. It's easy for those of us who have attended the Anaheim Family YMCA's Camp Fox program on Catalina Island in California to wax poetic about our special place. Any camp director or volunteer would argue they have the greatest site, the greatest campers, and the greatest program. What makes our camp unique among many others across the country is how our site, campers, and program are interwoven with a strong and beloved music program. While our camp draws on a five-decades-long tradition as a singing camp, our music program can certainly be replicated and built upon by any program anywhere. All it takes is a couple guitars, a little planning, and a lot of enthusiasm. It's really no wonder that music and camp go hand-in-hand at most resident camp environments. But far more than singing a few songs after meals and at campfire, for the Anaheim Y, music is the constant undercurrent of our program. Our campers say it's a significant reason why they keep coming back and why they feel connected to our program for the rest of their lives. In the 1960s and 1970s, music at our camps was mainly composed of what we now call "old-school camp songs." We "weaved the sunshine, our day was done, and John Jacobed his Jingleheimer Schmidt." All we had were a couple guitars, a harpsichord, and a beat-up old upright piano in a dining hall with poor acoustics that echoed every note we made. Our songbook was about twenty-five pages long and consisted mainly of Broadway show tunes and spirituals. That meant a lot of repetition over the week. But in the early 1980s, then-teenaged but now-Hollywood composer Douglas Pipes brought modern music to Anaheim's camp program and played these songs along with the traditional tunes. "One of the first ‘non-camp' songs I remember hearing at Camp Fox was ‘The Rose' by Bette Midler. To this day, when I hear it on the radio, it brings back such fond memories," said Tommy Martindale, a thirty-three-year camp veteran. Our songbook now numbers more than 110 pages of Broadway tunes, a cappella melodies, and hand-motion favorites; it also includes classic rock, contemporary rock, and pop hits. Every year we add more songs to the mix. To develop and maintain the musical undercurrent, we play roughly fifteen songs every day with the whole camp and repeat only rarely and only the best ("One Paddle, Two Paddle" never gets old, and the kids love "Lean On Me"). That means we play two at our morning gathering prior to breakfast, three at each mealtime, two at the campfire where we close the day, and then two more at our YMCA Rag ceremonies. The Rag program is a series of personal challenges for individuals who wish to better themselves. An extensive planning effort by a core group of four volunteers takes suggestions from volunteers and campers who contact us throughout the year with ideas and incorporates them into the music program. We begin meeting to discuss songs many months before we set foot on the island. We always look first at the lyrics to decide which fit with our theme. We call these our token songs. We look for currently popular songs the campers would know, but we also try to introduce them to new genres of music. Younger kids often haven't been exposed to James Taylor and sometimes we older folks tune out Christina Aguilera, but both artists have inspiration to offer through their music. These days, artists like Dave Matthews, Jon Mayer, and Jason Mraz are often on our list. Music at camp inspires internal reflection and outward expression, but it can only do that if the lyrics meet campers' needs. Yes, campers love the old stand-bys, but most relate better to what they're hearing on the radio back home, so that's why we spend so much time planning. For example, when we opened camp with Natasha Bedingfield's "Unwritten" ("Staring at the blank page before you/open up the dirty window/let the sun illuminate the words that you could not find"), we began discussions related to goal setting and planning. These played into our overall theme, "Under Construction," which taught campers that we're all works in progress and that you can build your life with a blueprint for what you want to achieve. Songs like "Beautiful" by Christina Aguilera, "Devotion" by The Stereo, and "The Riddle" by Five For Fighting played similar roles. While we very rarely repeat a "token" song during the week, we opened and closed camp with "Unwritten." At the opening campfire a camper sang a moving, contemplative solo while I accompanied on guitar; then, an upbeat, excited, make-shift choir with whom I'd worked during the week sang it on the morning of our final day at camp. This past summer was one of the best years for music we've ever had. In addition to everything we currently do, a local music shop donated electronic drums and other various percussion instruments allowing us to explore more potential for musical talent in our camp. More and more people got involved in the song planning and preparation from volunteers to campers. Practicing the music to be sung at camp with some of the actual teenagers who would be going to camp was an extraordinary experience for everyone. Upbeat songs are best for the mornings, and we save the thoughtful ballads for evening campfires. After meals, though, we haul out the power-driven, hands-down favorites. Kids stand on their chairs, lock arms, and rock out to Styx's "Come Sail Away"; Elton John's "Rocket Man"; as well as the old favorite, "Make Your Own Sunshine." Mealtime songs are performed with one or two guitars and an electric keyboard plugged into a sound system we bring to camp. Every night at dinner, a full band — "Sal and the Monellas" — plays a variety of popular new and old camp songs. "I think that all of the songs, especially at mealtimes, really help to bring everyone together. As teenagers, we are all self-conscious, but when we are all on our feet and the leaders and staff are making fools of themselves, it's a special moment because we laugh together and not at each other," said teenager Nikki Klein, who's been coming to camp for nine years. Both before and during camp we respond and reach out to campers (of varying talent levels) who want to perform at camp. We practice the song with them, and that gives them a sense of ownership as well as reassurance that they're an important part of our camp family. They're encouraged to sing at our morning gatherings, meals, campfires, or the one-day festival that was modeled after MTV's Unplugged. We still call it "Unplugged" but we're as plugged in as ever. Campers are welcome to sing, play, read poetry, do stand-up, or give any other kind of performance for the rest of camp — all of whom wander over to the stage to watch and listen leisurely. "Unplugged" in particular gives campers an opportunity to show off whatever talent they have in a loosely formatted, low-pressure setting. Watching kids do this is a very special thing. We encourage campers, leaders, and staff to bring any and all instruments to camp. During the day, we might organize a drum circle with the percussion instruments and occasional brass or woodwind or call together guitar lessons under the pepper tree. It's rare to see many campers together without guitars on which kids are teaching each other or practicing blues progressions or camp songs. At our camp we have nearly twenty-five guitars floating around. Some of our camps host amateur musicians, and others have been the performance venue of professionals like Doug Pipes and Gwen Stefani — before they hit it big. We realize how blessed we are to have this much talent and sheer musical power, but all you really need is one or two people who can play basic chords on a guitar and a whole lot of enthusiasm to back it up, and you're half way there. Seriously. Music helps translate intangible ideas through a medium campers aren't exposed to every day at school — the last thing they respond to during the summer is a pontificating figure-head lecturing about how to live a moral life. For some, reading the lyrics in the songbook helps them understand the general message, while others respond after listening and singing along. We encourage our campers to listen to these popular songs as they relate to the theme, and truly they're able to see the song in different and more powerful ways. "Every time I hear a song that was done at camp, I remember back to that exact moment, and its meaning sticks with me forever. It's an amazing thing," said Chris Kent, who has been a leader in our program for the last five years and was a camper for several before that. "I have had campers that refuse to stand and sing at the beginning of the week, but by the end of the week, it's their favorite part of camp." And those campers are our favorite part of the week, too. There's nothing more gratifying than watching the isolated kid who came to camp alone silently read the lyrics the first day, mouth the words through a frown the next day, sing and do some hand motions the following day, and finally lock arms with his cabin mates and laugh so hard that he's unable to finish the song as we wait for the boat to take us home. We really believe it's the music as much as anything that breaks down barriers and brings our campers together so they can unify as a cohesive cabin of kids and build a foundation for lifelong friendships. There's something very special too — for us and for campers — when they've stopped and really listened to the lyrics of bands like The Foo Fighters or Green Day. When you have over two hundred kids at closing campfire singing a moving rendition of "Times Like These," you are reminded that, truly, "it's times like these you learn to live again/it's times like these you give and give again." And what better way to give and give again than through music? Originally published in the 2008 November/December issue of Camping Magazine.